Jean Arp (1886 – 1966) sculpted, painted, wrote poetry and created abstract art – a well-rounded and skilled German-French artist. 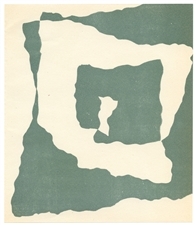 Born Jean Arp to a French mother and German father, Arp referred to himself when speaking in German as "Hans." Jean Arp moved back and forth between Germany and France during his art studies, and even escaped to neutral Switzerland during World War I. In Switzerland, Jean “Hans” Arp, Max Ernst and Alfred Grunwald founded the Dada movement, which promoted anti-war politics through visual arts, literature and graphic design. Through his art, Arp, Marcel Duchamp and other Dadaism founders were able to reject the modern norms of art and show their disdain for the war. Medium: original lithograph. 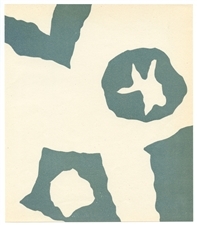 Printed on smooth wove paper, this original Jean Hans Arp lithograph was issued in 1951 for the hard-to-find XXe Siecle (issue No. 1), published in Paris by San Lazzaro. Sheet size: 12 1/4 x 9 1/2 inches (314 x 242 mm). Not signed. Condition: there is foxing and age-toning to the paper. 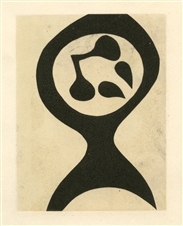 At Affordable Art 101, we have colorful woodcut prints, silkscreens, pochoirs and more by Jean Hans Arp. With bold, abstract shapes particular to the Dada style, these woodcut and other prints are an affordable way to bring original artwork to your home or office!